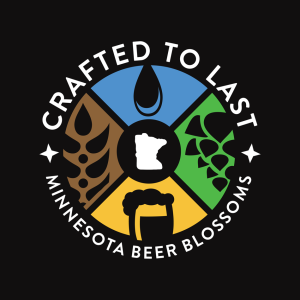 I’m always pleasantly surprised when I watch Crafted to Last – Minnesota Beer Blossoms and once again realize how closely it resembles the film I pictured in my head while making it. The main lesson I learned was that many more voices could be included in the film. My original target was 8-10 people in the film because I thought that too many voices might be confusing. To my great delight I soon began to understand that when many voices speak intelligently and with passion about the same subject, more is definitely better. Thirty-six people appear in the documentary and I think we could have squeezed in a few more. The idea was to create a narrative track that is basically one long conversation between all the people appearing in the film. Recording the speakers in pairs set the stage for this because it brings the viewer into the conversation as they listen with the silent on-screen partner. I had planned from the outset to break up the conversation with some sort of digression or a musical interlude, but the final context and content of what would become the Water and Beer Interludes was far from certain. There were a lot of ideas along the way. Animations, customer comments, history lessons, all were pursued to one extent or another. Both interludes were ways to include material that would have otherwise been deleted from the film. 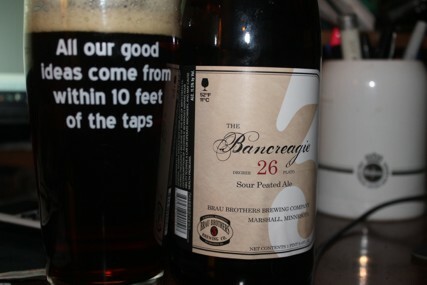 The discussions of water and descriptions of beers were too long and had not found a stable place in the time line. I had already made the dialogue track for the Water Interlude before Zack Lozier ever saw the film. He wrote and recorded “Here Come the Water” in the first round. 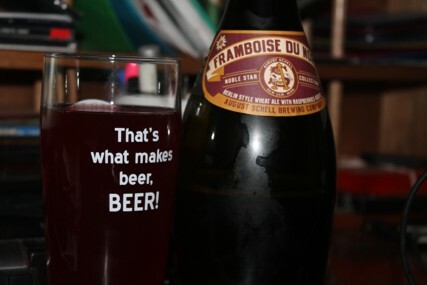 The success of the Water Interlude in saving that dialogue from the edit suite floor encouraged me to revisit the brewers describing their beers. The result was the experimental Beer Interlude where we play around with sound and image. I had worked with Zack’s music before I ever met him. Jesse Brödd sent me an MP3 of Fallout by one of his bands, Big Blue Station Wagon, to use in a short video I made for the 1 year anniversary of the Harriet Brewing Tap Room. The result – Three Minute Tap Room – compresses the build out of the tap room over roughly 3-4 months into approximately 3 minutes. 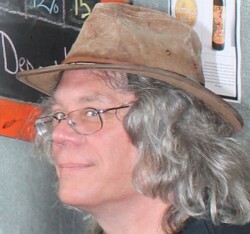 The Tap Room Time Progression video is a critical element of the film. 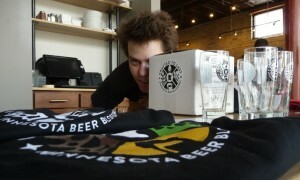 It is a visual rendition of what happened in MN when the tap room/pint/Surly Bill became the law of the land. Fragments of it show up multiple times in Crafted to Last and there is even a sense of the full progress of time when Jason and Jesse tell us about the controlled chaos of the build out, but nothing captures the dynamism and kinetics like Three Minute Tap Room. The music of Big Blue Station Wagon had pushed me in the right direction. 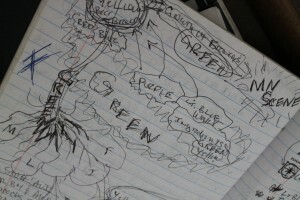 The plan was to make a documentary without a narrator or an interviewer. This puts more weight on the sound track, specifically the score to delineate parts of the movie and set the emotional context. Working with a local musician to compose an original score was in tune with a theme of local community that resonates throughout the narratives of the people in the film. After a few dead ends, I finally talked to Zack Lozier and he agreed to meet at Town Hall Lanes. We talked about music, moods and what I wanted to accomplish with the score. I explained my perspective that film is composed of 3 tracks. Dialogue, Sound and Image. I would sculpt the Dialogue track from all the people narrating the film and assemble the Image track from A, B and C Roll video. Zack would create the film score; the main element of the sound track. He was intrigued by the project because it challenged him to compose a lot of new music and to collaborate with a film maker. Something he wanted to do and something he had never done before. He agreed to experiment first and ask questions later, so the deal was done. I gave Zack a very early rendition of the film so that he could get a sense of what we had and where it was going. He is one of a very select cohort lucky enough to have seen Crafted to Last in its entirety without the B Roll video. Even so, he was able to discern the general themes in the film and begin making music to enhance the story. To give him a visual image that summarized the gist of the film I explained the scribbled diagram pictured to the left because it depicts the basic structure of the film. It shows a dessicated seed bursting out when suffuse with sparkling water that grows into a healthy plant well rooted in the local nurturing soil and then blossoming forth into full, succulent blooms. 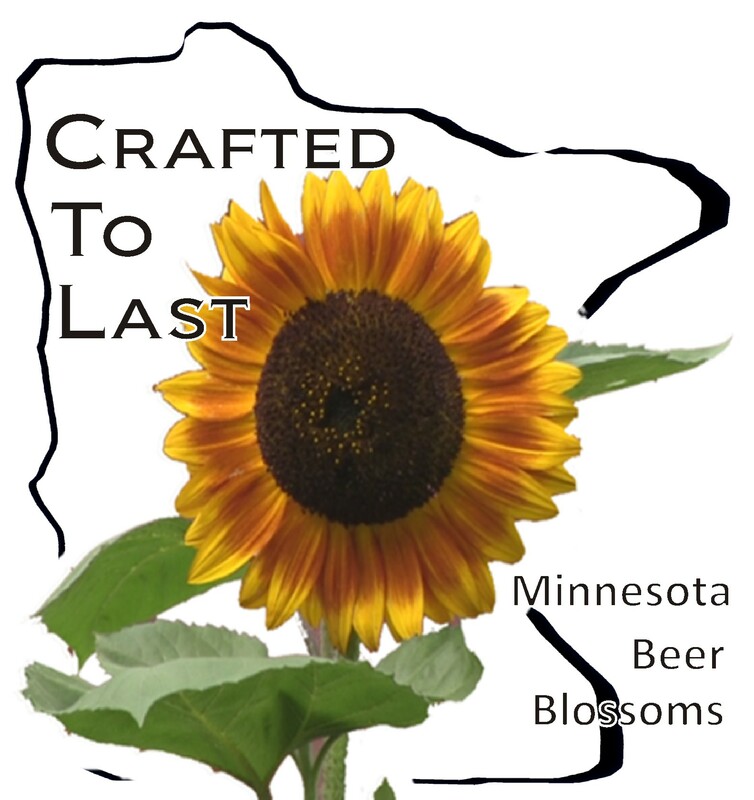 Each of the home brewers that went on to be featured in Crafted to Last are like the seeds, their breweries are the plants, and everything that comes from them are the blossoms. 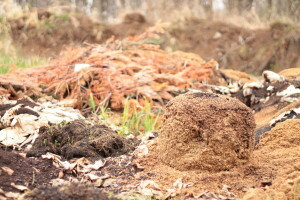 Reform of the distribution laws was like rain watering the seeds and stimulating them to grow in the rich soil of the local neighborhood. Amazingly, that was enough to inspire Zack to make an entire film score of new music with a cohort of players culled from around the Twin Cities. A couple more rounds of feedback and adding instruments to the mix and we had the music for the film. Working with Zack was a pleasure and it notably enhanced the film. That success encouraged us to take on the more experimental parts of the film. Where the Water interlude minimally digresses from the film to bring in lyrics from the score, the Beer interlude goes further as we mix dialogue and image with a more restrained score that echoes fermentation in the beat. These brief interludes distinguish Crafted to Last from other films about craft brewing and they came about organically while collaborating with Zack to create the score. These are my favorite parts of the film for these and many other reasons. Enjoy. We have movie-related stuff. 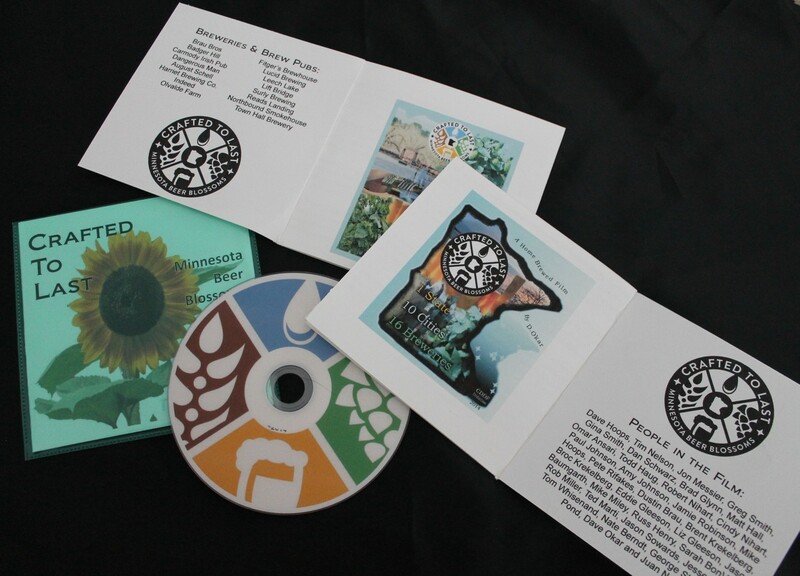 You can buy it at the screening events or contact us to purchase stuff. There will be a Stuff Raffle, too. At each of the screenings we will offer 4 prizes in the Stuff Raffle. 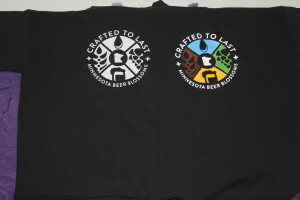 1) Crafted to Last T-shirt in B/W or Full Color on black 100% cotton. 2) DVD copy of the film. 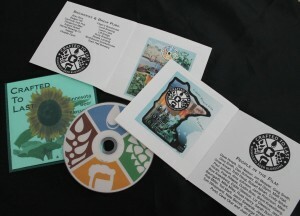 Handmade DVD package with 8 page insert. 3) Series #1 Glasses. 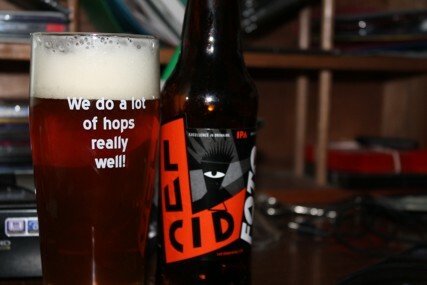 Set of 4 Willi Becher pint glasses featuring a full color logo and quotes from the film. Boxed, numbered, authenticated and sealed for maximum value. Limited edition; 125 numbered sets. 4) Series #2 Glasses. Set of 4 Willi Becher pint glasses featuring B/W logos. Boxed, numbered, authenticated and sealed for maximum value. Limited edition; 125 numbered sets. 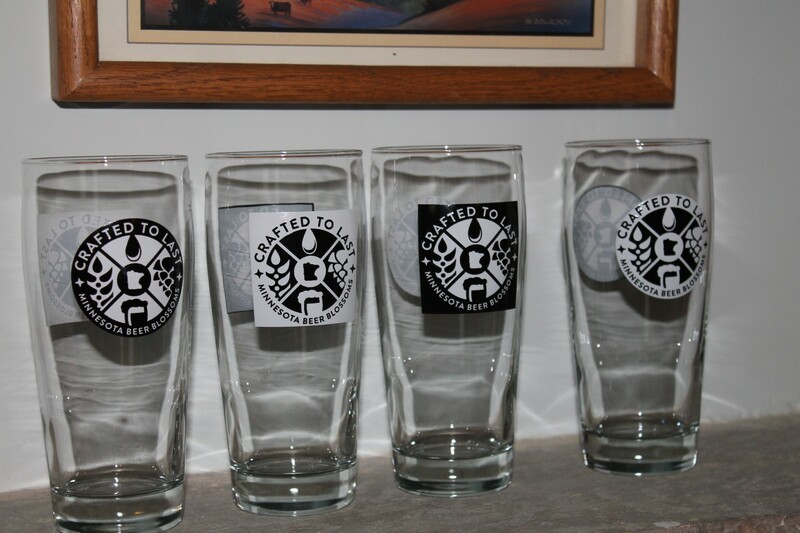 These are the Series #1 glasses pictured with beers from the brewery of the person quoted on each glass. Jon Messier, Ted Marti, Jason Sowards and Dustin Brau. 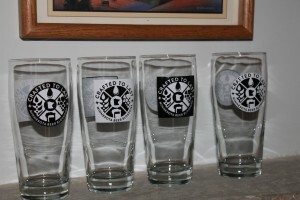 The other side of the glasses feature a full color CTL logo on a white background. 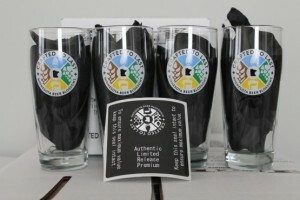 Series #2 glass sets feature 4 distinct designs with black and white CTL logos on round or square backgrounds. One of these shows up in the documentary, over flowing with Hot Box Imperial Smoked Pepper Porter a collaboration beer from Indeed and Northbound Smokehouse. All 4 prizes will be given away in the Stuff Raffle at every screening event during the CTL Film Tour 2015. Tickets will be available at the events. You can buy this stuff, too. We’ll have stuff for sale at the screenings. Or you can contact me to order what ever pieces of film related stuff you might desire. The Stuff Raffle is pretty simple. People get tickets and tear them in half so that each stub has matching numbers. They keep one half and put the other into the container that corresponds to one of the 4 prizes. When the movie ends, we’ll pick 4 winners from the stubs in each of the 4 boxes. You must be present and show the corresponding stub to collect a prize. Tickets will be widely available at low and no cost during the screening events. I mean, we’ll be giving tickets away and selling them for $2. 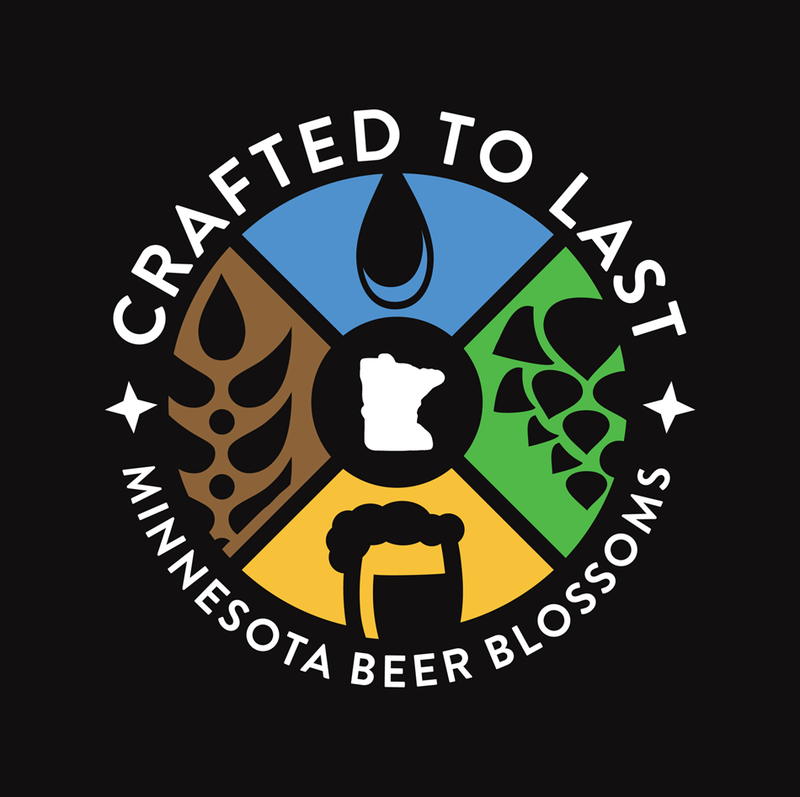 One way to score free Stuff Raffle tickets is to brush up on Crafted to Last – Minnesota Beer Blossoms trivia. This article is a goldmine of information that could very easily lead to free Stuff Raffle tickets and with some luck, Free Stuff. 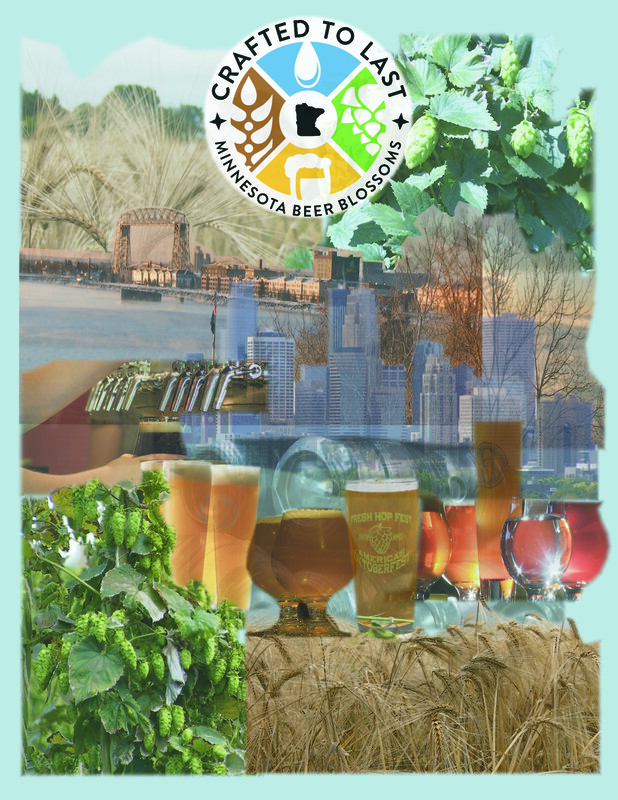 The best source is the MN Craft Beer Project Channel, where Crafted to Last and CDDF Productions routinely release new and vintage content. Matching people to quotes from the film, whether documented on glassware or not, seems a fertile place to for trivial knowledge. So too, this video “Right Before it Began“. 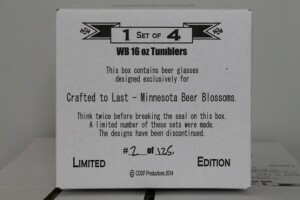 Careful listeners will find 4 clues to the design of Series #1 glass sets for Crafted to Last – Minnesota Beer Blossoms. This is the kind of knowledge that will get you Free Stuff. Seriously. The Minnesota House Commerce and Regulatory Reform Committee met for an informational session on the issue of repealing the ban on liquor off-sales on Sunday. A number of people testified in support of the bill introduced by Rep. Jenifer Loon (R; 48B). Troy Wing – La Crescent Wine & Spirits. Feel free to use these video clips in whatever way you see fit to support Sunday sales in Minnesota liquor stores. Find embed codes at the links or at MN Beer News. Hoppe for Reform of Sunday Sales? In mid-afternoon on April 8, 2015 in Room 10 of the Minnesota State Office Building, Rep. Joe Hoppe (R; 47B) called the House Commerce and Regulatory Reform Committee to order and quickly turned to Rep. Jenifer Loon (R; 48B) to concisely review the two bills she has offered to the legislature. The video clip includes an exchange between Loon and Rep. Raymond Dehn (DFL; 59B) that she deftly plays to good effect. Dehn’s logically-challenged and vaguely emotional broadside of store owners was reminiscent of satirical parody. 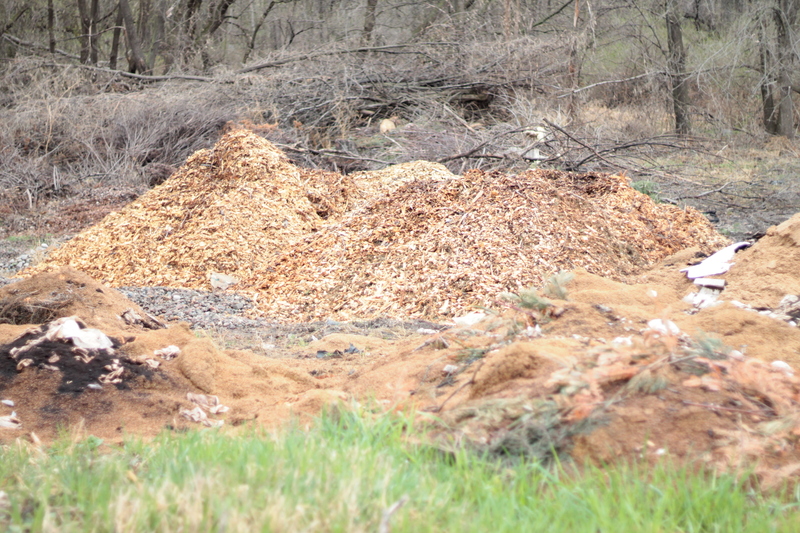 Especially in light of the preceding testimony from a number of business owners of precisely the type Dehn called out. By my count, 10 people testified in support of the Loon Bills. At least 4 of these were retailers and 2 represent consortia of retailers and manufacturers. Rep. Dehn’s puzzlement as to the motivation of small business owners and right-minded legislators with regard to repeal of Sunday sales prohibition was quelled by the Q&A with Rep. Sarah Anderson (R; 49A) that got right to the nub of the biscuit when she asked the assembled retailers to estimate how much business they lose every Sunday. When Dave Erickson, D’Erick’s Tower Liquor, testifies that at least a dozen and at most 50 people seeking off-sale liquor are turned away from his store on any given Sunday, I think about all the dollars hitch-hiking to neighboring states with thirsty Minnesotans every weekend. 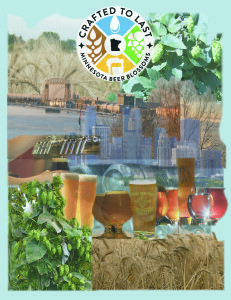 It strikes me that Dave’s story is the mirror image of that cross-border parade because he is talking about disappointing tourists from other states when they try to buy a few MN beers on their way out of town after having the time of their lives exploring Tower and Lake Vermillion. It is important because when retailers that depend on tourism fail to capture those outside dollars the entire region loses that particular piece of pie. If people stay home, or choose to visit a more reasonable destination, because they do not want to be caught up in the backward archaic Blue Laws in Minnesota, its a few more money dollars lost. Jason Alvey, The Four Firkins Beer Stores, suggests that economic benefit to the tune of $3000-5000 per week might be realized by closing on Monday and opening on Sunday. Monday is traditionally the least active day of the week for liquor stores, while Sunday may well be one of the best days for retail sales. This argument undercuts the contention that opening on Sunday will prove a losing proposition for some retailers. At a minimum, Alvey’s analysis suggest that without changing the number of days open in a week, stores could realize more sales by closing on a slow day and opening on Sunday. When I hear Jason Alvey talking about losing significant revenue every Sunday that he is prevented from opening his doors at The Four Firkins, I think about all the local businesses his stores support with the dollars you and I spent there last week. I mean, small businesses turn it over just that quick. When you spend locally, a piece of your money cycles back and does for a positive economy what vaccination is said to do for the the proverbial herd. It makes our economic community more robust from the grass roots up. Rep. Anderson lobbed the next soft ball right into David Ozgo’s sweet spot and he got extra bases with his estimate of $11 -15 million of increased tax revenues if Sunday sales are allowed. Taken in context of the testimony of Alvey and Erickson, among others, that point to beneficial increases in local cash flow through the private sector, the increased tax revenues indicate a parallel enhancement in the public sector funds. I see the increased tax revenue from Sunday sales as a kind of silent tax increase. The state gets more revenue, but no one feels particularly beset by the tax collector. Instead, we’ll be rejoicing that we can buy packaged booze and beer on Sunday while happily spilling cash into our chosen Sin Tax bucket as we sample another session beer and take notes for the upcoming bottle share. Even if all your faith system will allow you to think should be done with a budget surplus such as we have is to write your own version of a Jesse Check or a GWB Check you must agree that more surplus is better than less surplus because, if nothing else, bigger checks mean more votes and sloppier slush funds for attack ads. The two preceding video clips highlight the main economic arguments for the repeal of Sunday sales prohibition. They suggest that the change will benefit the private and public sectors through increased sales and tax revenues respectively. It is not all the time that public and private economic interests align and in this case the will of the people resonates with reform as well. The impact of the hearing depicted in these clips has been to solidify a base of support for Sunday sales reform. Instrumental to the recent success have been Reps. Jenifer Loon and Sarah Anderson, who with the guidance of Chair Joe Hoppe have set the table for the MN Republicans to make reform of liquor distribution laws a central issue for their caucus moving forward. The last word here belongs to Rep. Loon. In response to Rep. Dehn she undercuts his argument that liquor retailers should not petition to change distribution laws because these are time-tested and effective. Of course, the testimony of the supporters of repealing Sunday sales prohibition strongly undercuts the cynicism of Rep. Dehn and should offer him a way out of the politically untenable morass into which he and the DFL have stumbled. A couple of days ago a fan contacted me about hosting a screening in his home. We chatted about the idea over beer. 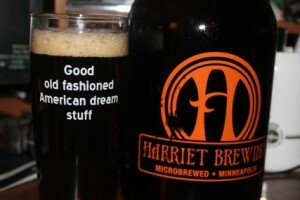 We’ll show the film to a select group friends while sharing beers and talking about Minnesota beer. I like it. Would you like to host a screening during the CTL Film Tour 2015? Dates still available, June through November. Contact us. Crafted to Last merchandise will be available at the screenings. T shirts, glasses and DVDs. 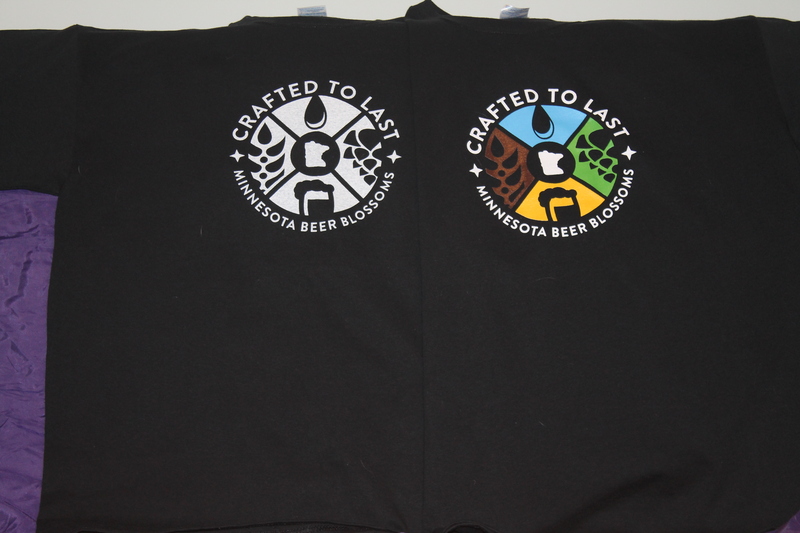 Black 100% cotton shirts feature either white or full color film logo. Glasses are Willi Becher style pints. Available in 4 B/W designs and 4 full color designs with quotes from the film. Both are available as limited edition boxed sets of 4 distinct glasses, numbered, sealed and authenticated. Only B/W glasses will be sold individually. This video is from a past crowd funding campaign, but it nicely summarizes what you need to know about limited edition glass sets. Shifting gears to get in tune with current events and future dates. We’ve been planning the CTL Film Tour. It is becoming more likely that many of you will get a chance to see my home brewed film in your neighborhood this year. Already screenings are scheduled at Lift Bridge, Kinney Creek and Northgate on May 14, 15 and 16. In that order. Show times to follow. In June we’ll be at Day Block and West Medicine Lake Community Club. June 3 we’ll experiment with the good people at Day Block on Pilot Batch Wednesday; 5-7 PM. On June 29th we’ll be in Plymouth; 7-9 PM. 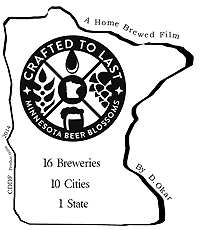 Plans for bringing Crafted to Last – Minnesota Beer Blossoms back to Duluth are beginning to gel and friends in Denver, Chicago, and Portland are asking how we might be able to bring the film to their neighborhoods, too. If you know someone or someplace that would like to host a showing during the 2015 film tour, get in touch with me. Brixton Hughes on FB or cddfproductions@gmail.com. From June to November. We are willing collaborate with the breweries to create specialty beer and video for release at the screening event. 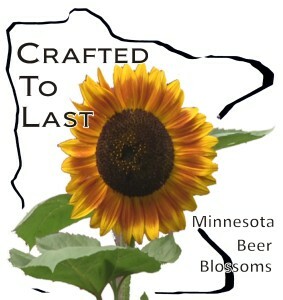 This short clip is offered to entice: More on the MN Craft Beer Project channel.